There is no doubt that Harry Potter reigns over the children's literature market. J.K.Rowling's inimitable cast of Harry Potter adventures has ignited the imaginations of children and grown-ups alike all over the world. But how much do you really know about J.K. Rowling's inimitable characters? Did you know that the Harry Potter characters hold secrets behind their names? Hermione, Snape, Crabbe, even Hogwarts School - all have histories waiting to be discovered. Now, two young fans of the Harry Potter series present a companion book for other readers who can't get enough of Harry and his friends and foes. This book, Friends and Foes of Harry Potter: Names Decoded, reveals the secrets behind the names of the mysterious characters, houses, and pets. Written by young fans, for all fans, this book also offers journaling space, trivia quizzes, and exquisite illustrations. This book is a perfect gift for children and adults whose inquisitive natures match those of their favorite heroes, Harry, Hermione, and Ron. Fans can quiz each other and use the glossary to look up unfamiliar terms that are unique to the Harry Potter series. What is the meaning behind Harry Potter's name? Or the uncanny resemblance of Voldemort to the Roman god of Time? 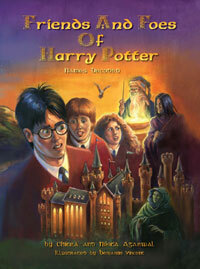 You'll have to read Friends and Foes of Harry Potter to find out! Thanks to their intellectual curiosity, Nikita and Chitra have revealed a deeper level of meaning in the names and symbols of the world of Harry Potter. Harry Potter’s Friends and Foes is a work of serious research and imaginative wonder. It will delight new and faithful readers as another window on a magical world. 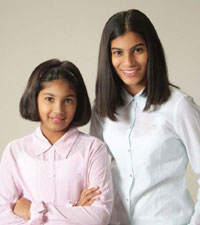 Nikita Agarwal is in fifth grade at The Hockaday School in Dallas, Texas. Her hobbies are reading, snorkeling, swimming, and skiing. She loves the Harry Potter series and her role model is J.K. Rowling. Niki’s favorite Harry Potter book is Harry Potter and the Goblet of Fire. Chitra Agarwal is a sophomore at Lutheran High School in Dallas, Texas. She loves theater arts, ice skating, hanging out with friends, and going to the movies. Chitra’s favorite Harry Potter books are Harry Potter and the Prisoner of Azkaban and Harry Potter and the Goblet of Fire.